Pisces Fish Machinery has developed its line specifically for the rigorous requirement of processing a larger fish like Hake. The machines are built to with stand the long and intense Hake fisheries season. Pisces’ Hake processing equipment has proven itself a reliability and efficiency option in multiple plants. Pisces Fish Machinery has been produced roller graders in use though out the world. Pisces usually suppliers the machines with stands, catwalk, infeed hopper and out feed conveyors. The machines range in size from 7 to 13 rollers. The roller graders are equipped with a shaking infeed tray to ensure consistent flow of fish to the grader. The PN-700 produces a head and tail off belly closed product. The PN-700 uses vacuum to remove the viscera. 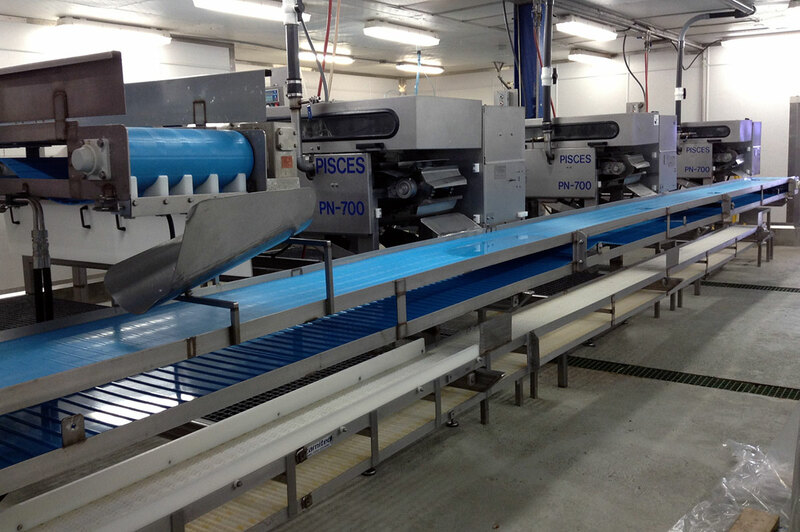 The machine operates between 100 and 180 fish per minute with two or three operators. With extensive experience serving the needs of processors worldwide, Pisces provides fish processing industries with the latest technology in equipment and integrated solutions. Copyright © 2018 Pisces Fish Machinery Inc. All rights reserved.